If you’re skipping breakfast or rushing out the door without much thought for what you might eat before noon, you could be sabotaging your dietary goals. CLAWSON, Mich. — It's easy to skip breakfast or rush out the door without much thought of what to eat before noon. But those who skip breakfast could be sabotaging dietary goals. In order to remember to fuel up, some folks already have a routine. “I got my juicer at home, and I’m juicing every morning,” Juli Grant of Detroit said. She is a strong believer in celery juice. Kyra Jordan of Southfield, MIchigan, has a plan if she doesn’t have time to make breakfast. “A granola bar and a good tea,” she said. Having a balanced, nutrient-dense meal is what online coach Dani Dudek recommends. The wellness and fitness influencer based in Clawson has been open on Instagram (@dani_dudek) about her 70-pound weight loss that began in 2015. “It took me about two years,” Dudek said. She exercised a lot, but she credits 80 percent of her success to the changes she made in her diet. She has three tricks for healthy eating on-the-go. “My go-to meal on-the-go is always going to be protein oats,” Dudek said. On Sundays, she makes all her breakfasts for the week. She combines old fashioned oats with cauliflower rice, almond butter, protein powder, and almond milk with a dash of cinnamon, honey, or stevia for sweetness. She makes four-to-seven servings in easy-to-carry containers, and then she stores them in the refrigerator. She said they keep for up to a week. Adding protein powder to any morning beverage — tea, coffee, or even juice — can make that drink a quick meal. Dudek pours chai into a blender, and then she adds a scoop of protein powder. A quick turn in the blender, and it’s all frothed up. “You have a latte that is low-carb, low-cal, high-protein — on-the-go,” Dudek said. Those who have to reach for a meal bar should opt for ones with whole foods for ingredients, Dudek says. She recommends RX Bars that have no added sugar, no gluten, and no fillers. Ingredients might include egg whites, almonds, cashews, and dates — that's it. She also likes vegan GoMacro bars for their high protein content. 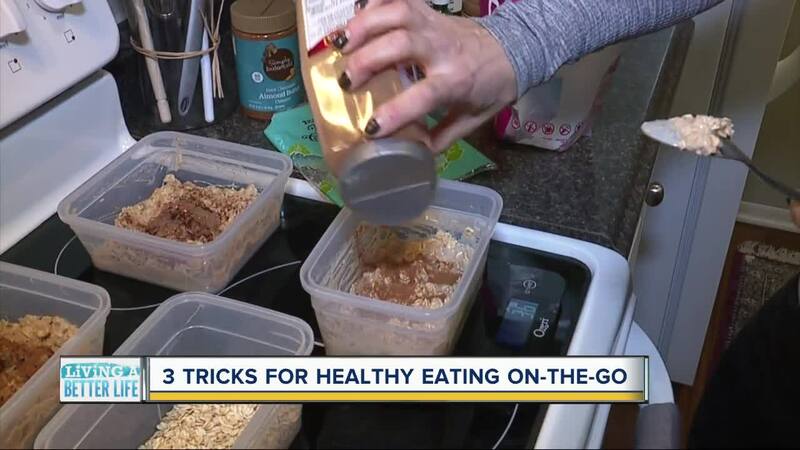 Dudek said what’s great about all three of these protein-packed tricks is that they keep people feeling fuller longer compared to many fast food options, high-carb baked goods, or sugar-packed cereals. That will help beat back those mid-morning cravings that can often send many stalking the vending machine.